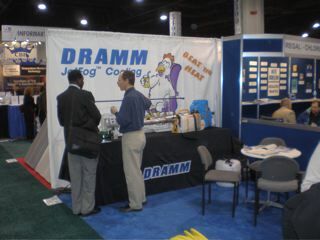 Manitowoc, WI- Dramm's new JetFog Livestock Cooling System is a big hit at the International Poultry Exposition in Atlanta, Georgia. Dramm's innovative system utilizes line pressure (50 psi) to create a fine mist that evaporatively cools the air in the barn. The heart of the system is the Dramm JetFog nozzle. This nozzle has an output of 1.6 gph (5.8 lph) at 50 psi. The 80 � (micron) mist created by the nozzle easily evaporates, utilizing heat energy, cooling the air. to plumbing and the nozzles. For more information on the JetFog Cooling System, please contact Kurt Becker at Dramm.